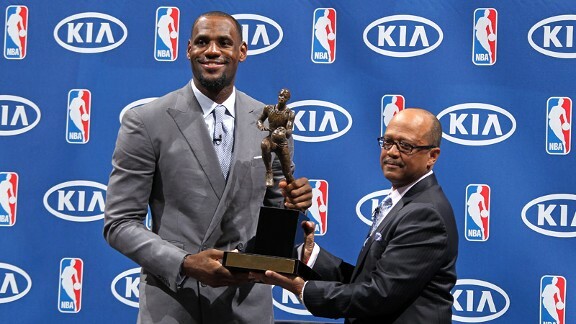 Lebron James has taken out the NBA's league MVP for the third time. He has become the 8th player to ever win the MVP award at least 3 times. James joins Kareem Abdul-Jabbar (6), Michael Jordan and Bill Russell (5), Wilt Chamberlain (4) and Larry Bird, Magic Johnson and Moses Malone (3) on the list of players with at least three MVPs. With three MVP awards and not one championship ring it puts a lot of pressure on James to perform in the finals series. With Bosh out indefinitely for the season, the Miami Heat are still going into most games as the favourite, but James has been the favourite in games since coming into the NBA. The partnership of Dwayne Wade and Lebron James can bring a championship but will still probably be the most hated team in the league. It cant be denied that he is a great basketballer and i'm sure he will get one in the years to come but it takes a team to win a championship and a great leader. It will be interesting to see if the heat can come up with the goods this year but i'm doubting there chances as this finals series continues.